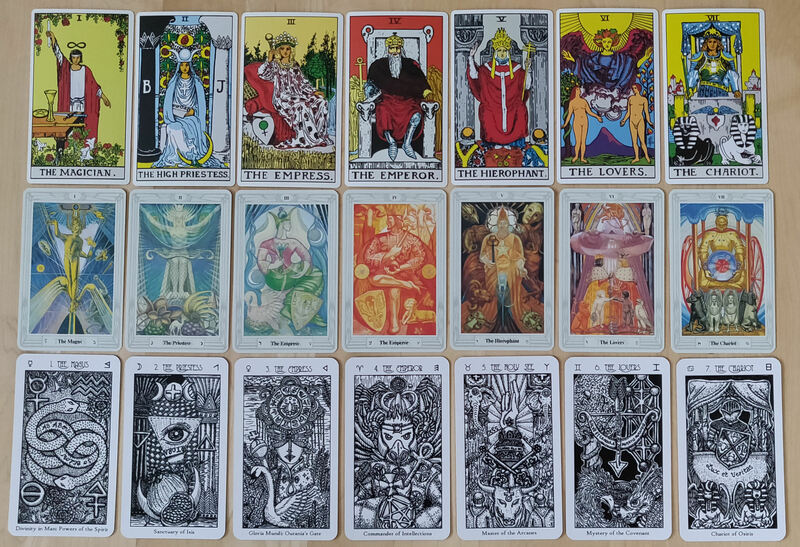 Over the last few months as I shared progress photos of my card illustrations, especially when we got to the Minors, RWS folks started to get confused by my pictorial interpretations, though I think that’s because Thoth influences started to show up more prominently. On my shortlist of objectives for creating Spirit Keeper’s Tarot, one of those objectives was to harmonize the RWS and the Thoth together, which I’m going to say right up front turned out to be a lot harder than I thought it would be. It was so hard for me that in fact at many points during the process, I was beating myself up and lamenting, damn, I’m failing so bad at this. 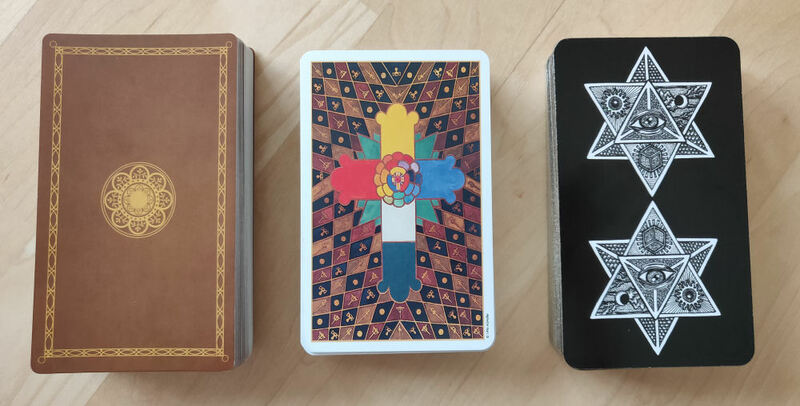 I figure a side by side review of the decks will help clarify some of the confusion about where I’m getting what for the symbolism I’ve opted to go with in Spirit Keeper. 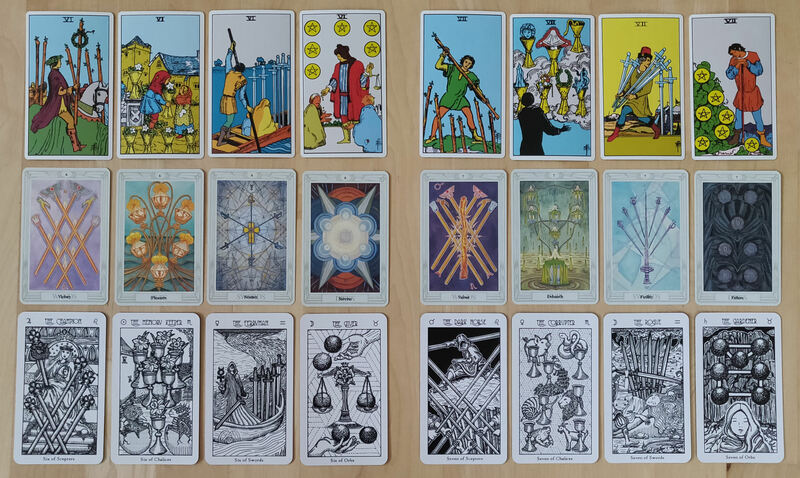 To do that, I’m using The Original Design Tarot Deck published by Siren Imports for the RWS and the Thoth Tarot Deck published by U.S. Games for the Thoth. I printed a sample copy of my deck, which you see above on the very right, but this is not what’s going to be produced for sale. I printed this physical copy to scrutinize the lines, production quality, alignment, that kind of thing, and because of that, I’ve already spotted things that need to be fixed, which will get fixed before final production. So just bear in mind that what you see here for the Spirit Keeper’s Tarot is pretty damn close to what will be offered for sale later down the line, but with editorial improvements. Speaking on the design of the Majors from my frame of mind, the voice of what I might describe as my inner genius came through more distinctly. And by genius I don’t mean hey look at me I’m objectively a genius, no. I mean that inner genius we all have that we need to go through the structured, methodical process to unlock. That inner genius is what I’m saying really came out. I say that because I think something shifts by the time I reach the Minors. More on that later. I’m picturing the cards in the exact order I drew them. You’ll see back in the First Septenary Keys I to VII, there were no human figures depicted. I had started the project with the intent on having no depictions of humans. Where human-like figures would be used, they’d be, like, you know, with an animal head or something, the way you see in The Emperor, or most of the face concealed from view, like The Empress. Then I got to Key 8 Strength and broke that rule. Doh. 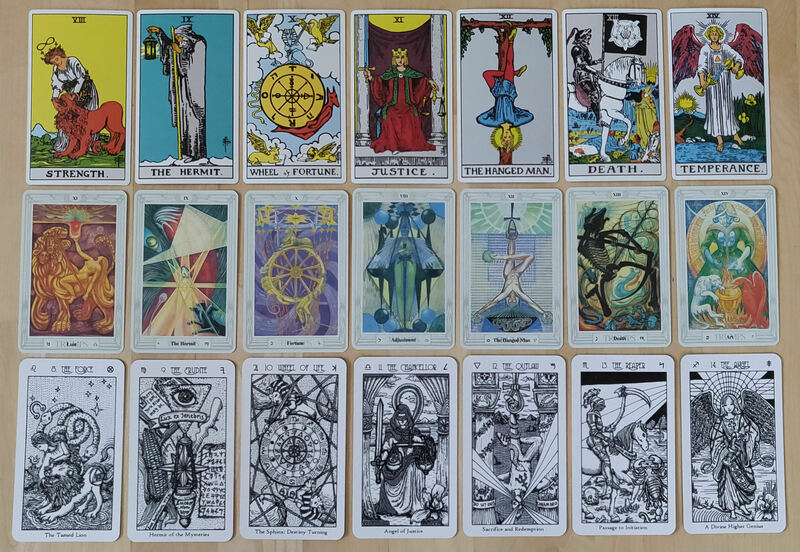 By the way, I devote a whole section in The Book of Maps, the companion guidebook that will go along with Spirit Keeper’s Tarot, to the Key 8 and Key 11 situation and my struggle with deciding how to approach the 8 and 11 switch, which funny enough, involves the Justice card and those goddamn balancing scales. I felt like there had to be more to the reasoning for Waite’s switch than the order of the zodiac wheel. My speculation at the end of that struggle is it had to do with differing theology, so then I had to decide where my own theologies aligned. 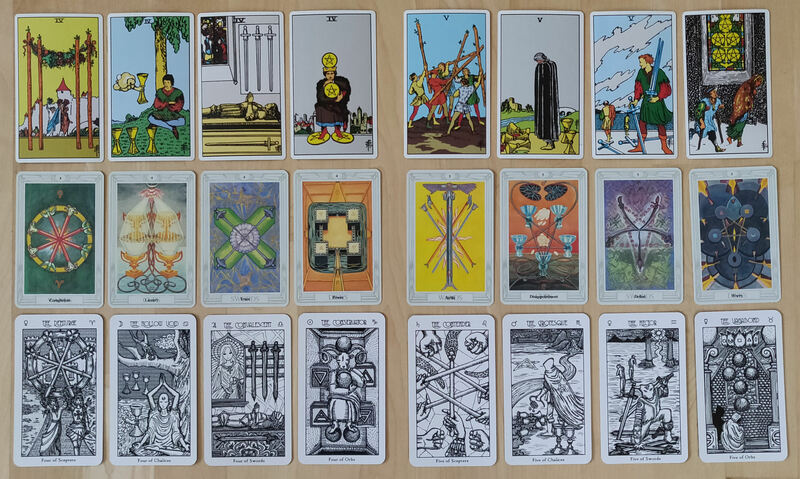 Since I went with Key 8 for Strength and Key 11 for Justice, following Waite’s switch, for an easier comparison, in the above photo I switched 11 for 8 and vice versa in the row of Thoth cards. 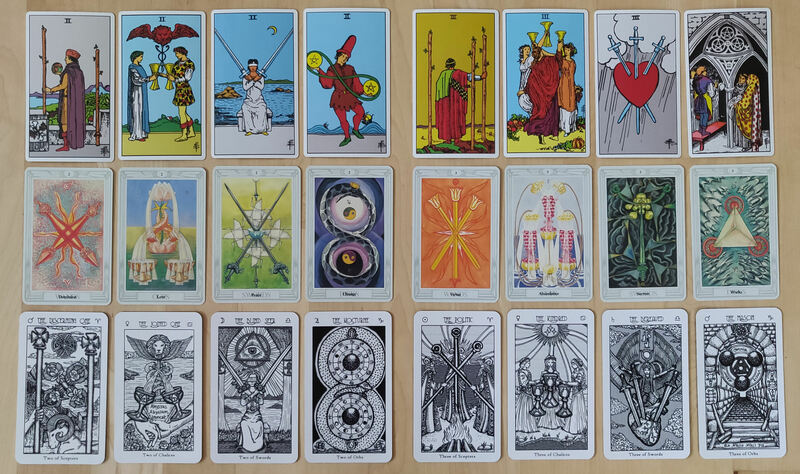 Although there are inevitable nods to the Marseille, the reason I didn’t focus my intentions on actively integrating the Marseille is because for Spirit Keeper, my focus is on the esoteric and occult expression of the tarot. The Marseille is by original intention a deck of playing cards that later got appropriated into a form of divination or fortune-telling, whereas both RWS and the Thoth were from beginning to end intended as esoteric and occult expressions of the tarot. 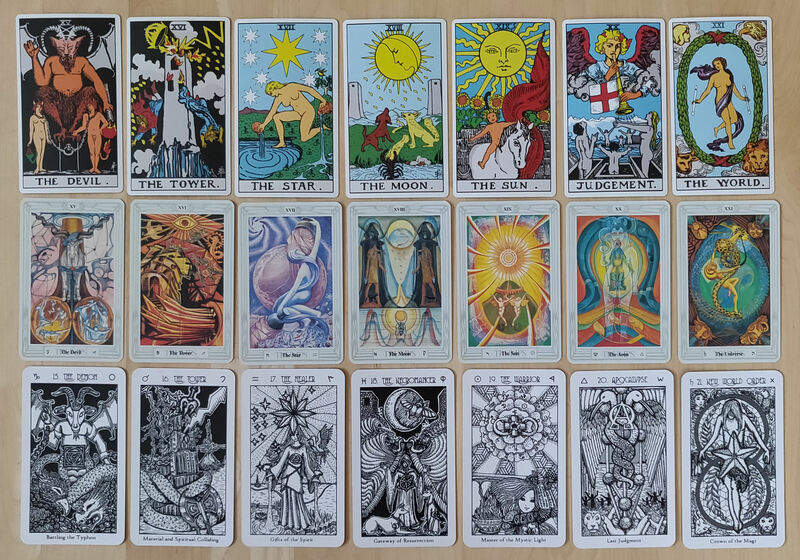 You could even argue that both the RWS and the Thoth tarot decks are the product of spell-crafting, born from fertile pools of knowledge and magical experience. That is why these two in particular are the chosen parents. Now those familiar with the logistics of deck production get the whole 80-card deck vs. 78-card deck situation. Whether you produce 80 cards or 78 for your tarot deck, you pay the same unit price for production. That’s why you often find two random cards in the deck reserved for advertising or a title card, etc. As an avid deck collector, I’ve always found those extraneous cards to kind of be a waste. So I wanted to really make the most of the two extra cards. I then came up with the idea of always designating The Fool card in Spirit Keeper’s Tarot as the significator, if and when a reader works with significators. If you don’t work with significators, forget the whole conversation– proceed as usual and just select the version of Key 0 you like most. 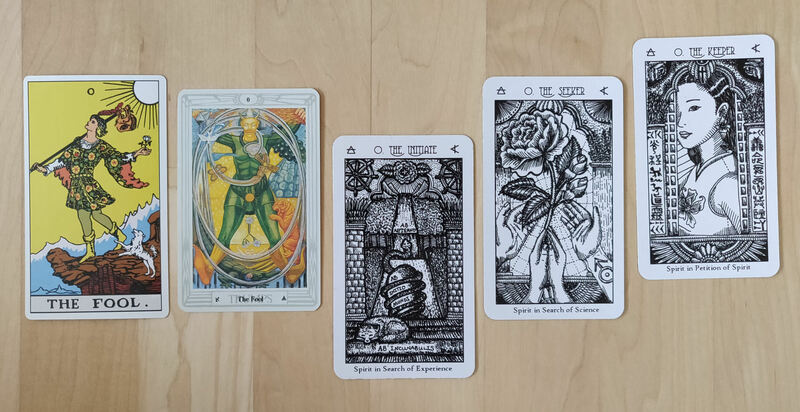 So now I have three Key 0s that represent three traditions of interpreting The Fool card in the tarot (this is coming from Crowley’s works) and also three stages of the Fool’s journey, or our own life journeys, kind of echoing the three acts of a play. The first Minor I drew was the Four of Wands. Before each and every single card, my evidence-based ritual was to read Waite’s Pictorial Key entry for that card (and no more from the book in that moment) and then Crowley’s Book of Thoth entry for that card (but often had to read around what he said for the card in question, i.e., the general remarks, etc., since for a lot of them, it was no more than one sentence; he focused more on the Kabbalistic, numerological, and astrological links for the cards). When I didn’t feel comfortable with my independent understanding of the Kabbalistic link, I would then need to go off and do even more reading and research before returning to my design. Also, Crowley would make all sorts of references where I was like, I don’t know what that is, so again, pause, run off on an errand of research, and then return only when I felt stable enough about my understanding of Crowley’s references. However, I will say that I found Crowley’s writing to be far more cogent than Waite’s. Waite’s writing in Pictorial Key was self-congratulatory through most of it and “well you don’t need an explanation for this, because if you don’t know it, then you don’t deserve to know it, and if you know it, then I don’t need to explain it to you.” Alrightey then. Though Waite’s vibes are strongly paternal and at least for me, I found a lot of comfort in that. The intuition-based ritual was to then close my eyes and visualize a scene “from nowhere” (it’s not from nowhere, but that’s how I tried to think of it to start) while calling upon the spirit of that Key. A scene would come into focus, and then I’d enter and pathwork through that Key. When I got a name for the spirit, I’d then set my intentions to channeling that spirit for further insights into that Key. I would also summon the two for whatever helping hand I could get but we’ll say no more on that and just move on. 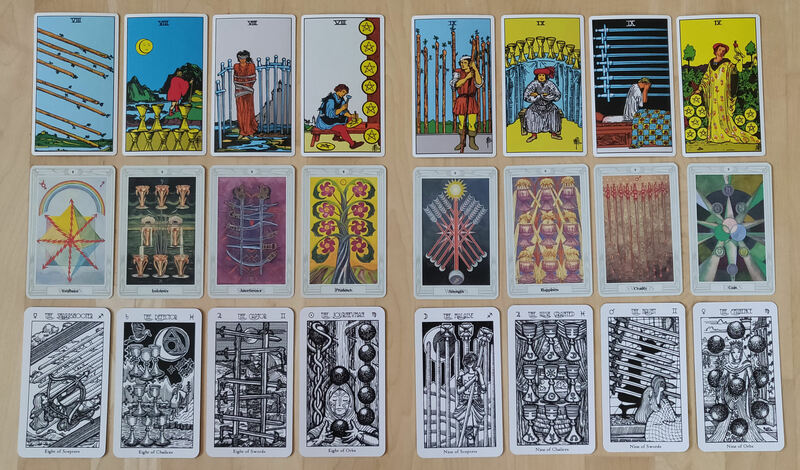 Balancing the so-called evidence-based ritual and intuition-based ritual is how I approached each and every single card, one by one, in a very intentional order, which I call Realms. The Majors are the Primordial Realm. Fours to Tens in the Minors are the Seven Lower Realms. Aces, Two, Threes, and the Courts are the Seven Upper Realms. All this is explained in The Book of Maps. Now, while the Majors were very much a product of that inner genius and in its own unique way conveys me, the Minors still convey me, but felt a lot more channeled at this point, and from my perspective– okay here’s an analogy. Ever experienced mediation during a lawsuit? No probably not. Okay, in mediation there’s an appointed mediator who puts the two fighting parties in two separate rooms, then walks between the rooms to hear each side, and in an arduous back and forth process that goes on for hours sometimes the entire day, tries to negotiate a compromising middle ground between the two sides that both parties then need to reconvene in the same room, at the same table, to miserably sign off on. That’s what illustrating the Minors felt like to me. Whereas illustrating the Majors was very…. celestial, head up in the clouds and spacey, la-la-la. 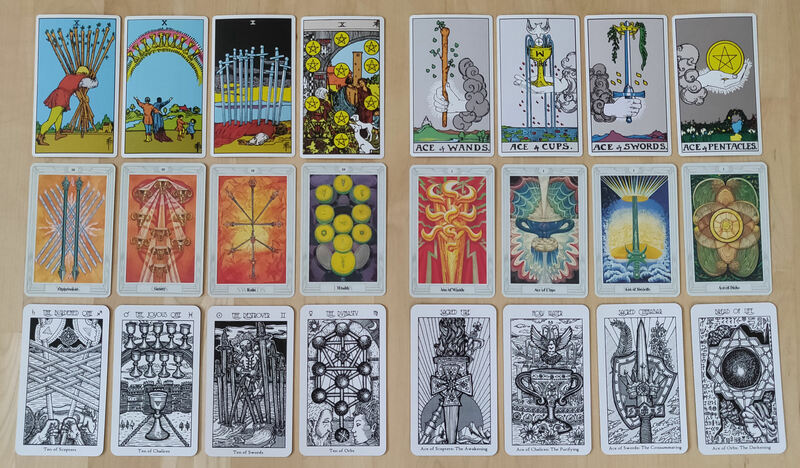 Quick clarifying note on my Eight of Wands: the two stripey thingies above and below the eight wands (or scepters) are supposed to be rainbows. But when I decided to go with a black and white deck, doh. It’s really in the Minors that the differing points of view between the RWS and Thoth are delineated. Pamela Colman Smith’s background in theater starts to come through, as I find the Minors in the RWS to be decidedly performative. The RWS Minors emphasize emotion and story. In contrast, the Thoth Minors emphasize symbolism of established esoteric concepts and principles. The Thoth feels more conceptual and cerebral to me. In terms of artistic style, Harris went more postmodern for the Thoth, whereas Pamela Colman Smith’s art style is often described as Art Nouveau, or at least a product of the Art Nouveau movement. What’s kind of interesting art history wise is if you look at the dates these decks were created, Smith’s art style was a little antiquated for her time, meaning the trending art styles by the time she was illustrating the RWS had changed already, while she was still stuck in the Art Nouveau of her yesterday. On the other hand, Harris’s art style was a little ahead of her time, meaning she was at that very cusp of the change into more blatantly abstract, conceptual art. In my tarot universe (and the order the card entries will appear in The Book of Maps), Tens transition into the Aces, with Tens being the last realm in the Lower Realms and Aces being the first in the Upper Realms, so neato that my photos of the cards worked out in such a way that the two are side by side. Fun personal note: I took these photos in the order that they’re appearing in the post, using only natural light from the windows, no artificial electrical light (because those who take a lot of pics for social media will know: artificial lights tend to give off that awful glare). And it was early in the morning. The first photo (scroll back up if you care to) was taken around sunrise and by the time we get to here, sun fully risen. So you really see the subtle and gradual brightening in photos, even though I didn’t filter the images in any way. The court cards, I think, are where I diverged the most substantively from both Waite and Thoth, to really just go off and hammer out my own point of view. Since I did not stick to traditional gender roles or assignments in my depictions of the courts, I opted to leave out the whole “Page of,” “Knight of,” “Queen of,” titles you commonly find on the court cards and just went with my own angelic titles for hierarchy. 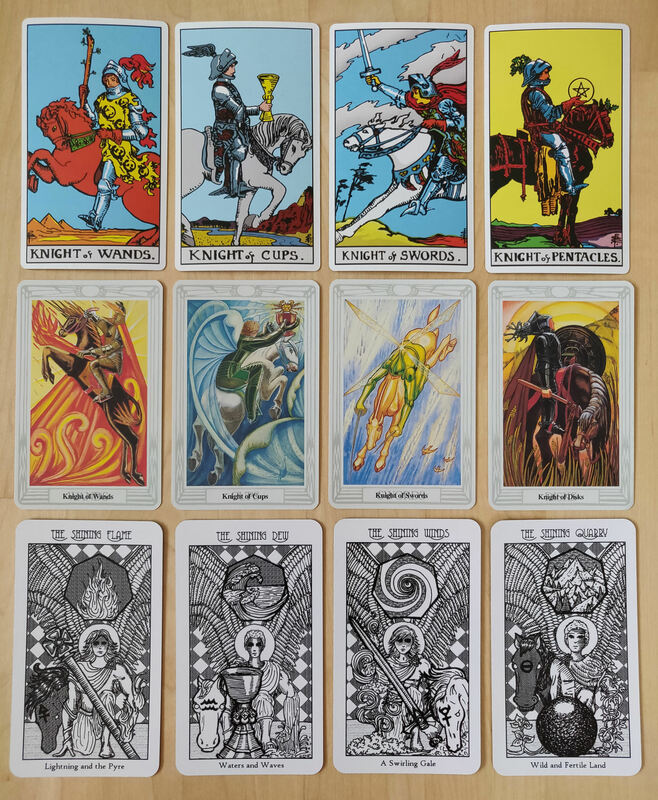 So based on the order of card entries and inferring from the text, most people–me included–would draw equivalence between Waite’s Knight cards and Crowley’s Prince cards (and later, Waite’s Kings with Crowley’s Knights). Going on elemental assignments as well, it seems to be Knight-Prince and King-Knight. However, imagery wise, you can see how the whole racket is confusing, yeah? Because the Thoth Knight cards look a whole lot like the RWS Knights and even the TdM (Marseille) Knights. So here I’m going to show compare-contrast pics of the Knight cards with both the Thoth Princes and the Thoth Knights. The wacko-doodle part is even though the Archangels are Kings, I took some cues from the RWS and Thoth Queens for the Archangels/Kings. Still with me? Look at the four RWS Queens. Which of those four Queens is noticeably different from the other three? Also, look at the four Thoth Queens. Again, which of the four is noticeably different from the other three? In both sets, it’s the Queen of Pentacles/Queen of Disks. I transplanted that concept over to my Archangels and depicted my Queen of Orbs (Pentacles/Disks) differently from the other three Archangels. I get into the why in The Book of Maps. Psst.. oh hey look! 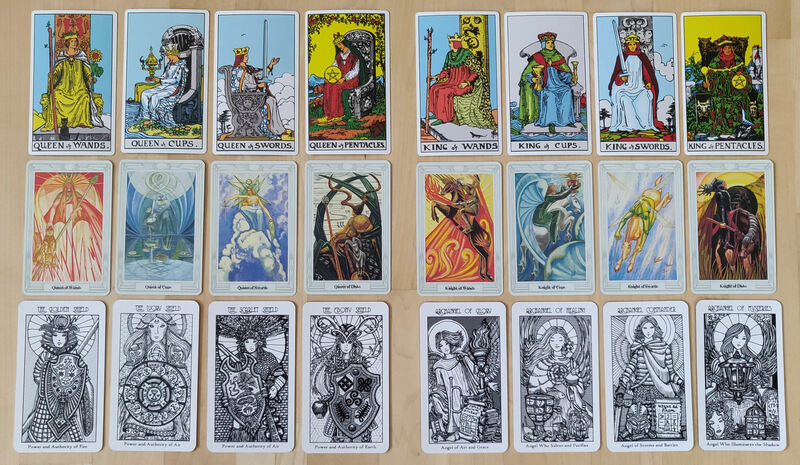 Both the Queen of Cups and Queen of Swords are “Air” according to my bottom captions. (Sigh….. Life.) Thank you, C, for spotting the typo! Many, many waves of gratitude your way. If anyone else spots things like that in the next, um, two weeks (hurry, please! ), please let me know ASAP! Again with the Knight, Prince, King, Knight puzzle. The earlier pic shows what I think most people equate with the RWS/Marseille Kings from the Thoth: the Knights. That approach also keeps the elemental correspondences in the courts consistent across Papus, some other guy forget who, Waite, and Crowley (i.e., Kings = Fire, Crowley noting his Knights = Fire). Although… if you’re considering the esoteric traditions that Crowley emphasized, Princes for Kings might make more sense because of the references to Merkabah mysticism (the chariots). Who knows. Someone maybe, but not me. I don’t know. Plus, by the time I got to drawing the courts, I think as “the kid” of the two parents I was reaching adolescence and had just about enough of both of them and wanted to go my own way to do my own thing. They were also paying a lot less attention to me by then and arguing more with each other so as the kid, I pretty much felt left to my own devices at that point. Figures of speech here. Of course. Very first time I shuffle with a new deck, I like to divide it into the number of card piles corresponding with my life path number. So that’s what I’m doing here. By the way I’ve been reading with my deck, both for myself and for others and zomg…. look. 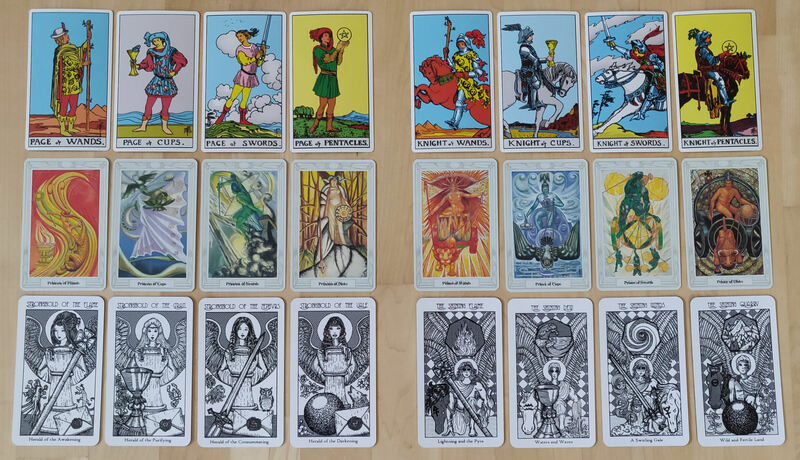 Every deck creator loves their own tarot deck (or… er… should… right? I mean, one would think…) so none of this is relevant at all. But I am loving this deck. I love how it reads. I love how accurate or resonant or who-knows-what the messages that come through are. I just love everything about it. I love its personality. I even love all the imperfections in the line work I keep on spotting. I actually do not hate the imperfections, which is kind of weird for a perfectionist. I really, really love everything about this deck. 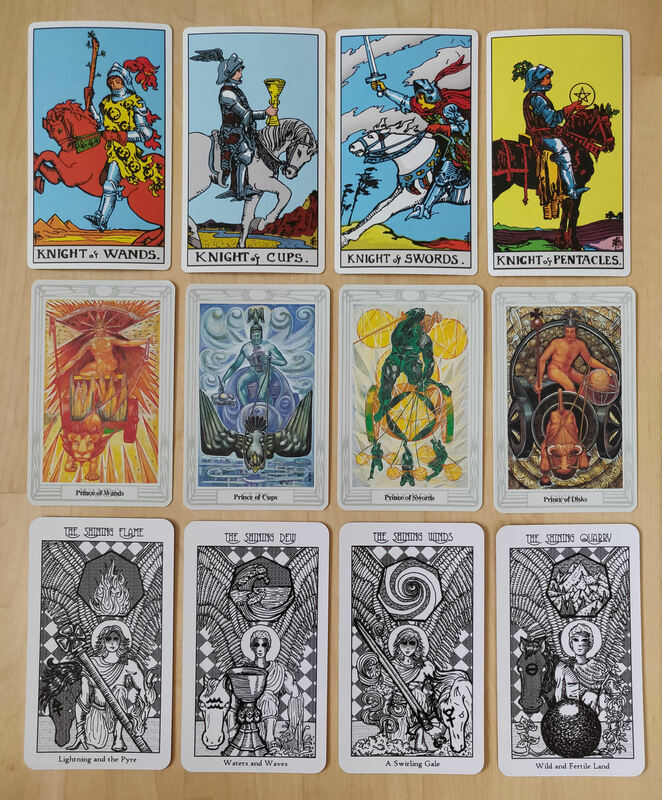 You’ll often hear a work of art or creative work product, such as a tarot deck, described as being the artist’s child. 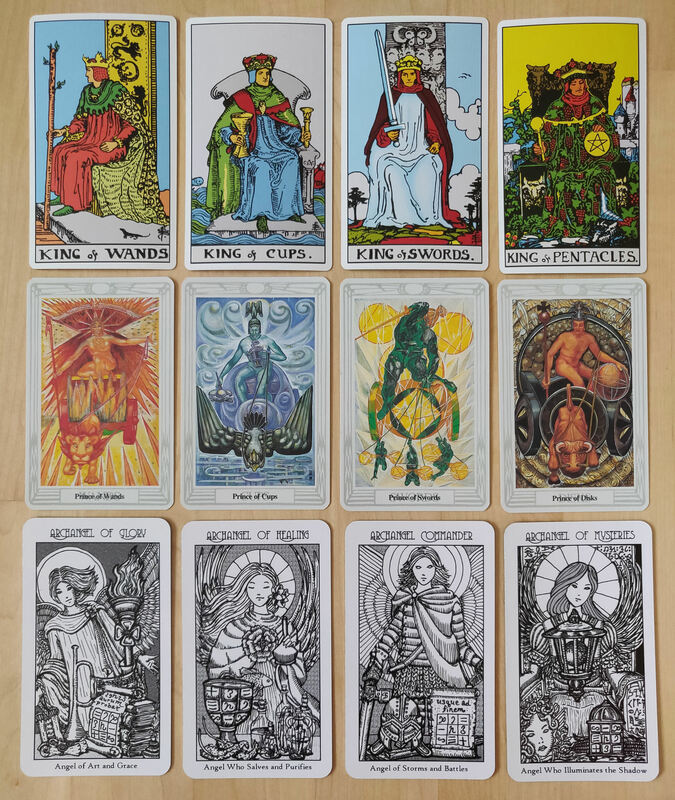 In my case, I feel like the Spirit Keeper’s Tarot isn’t my child…. it’s… me. This is me. I feel like you have probably answered this many times, but I am unable to wrap my mind around it. I know you stated we could download your deck for free. However, is your new deck and coloring book ever going to be for purchase? If so, how can I find out about where and how to purchase. Hi Tammy: The first draft of original line drawings for the Major Arcana only (unfixed, unedited, no digital alterations) are available for free download, along with a guidebook for how to do the ritual-coloring of the Majors.